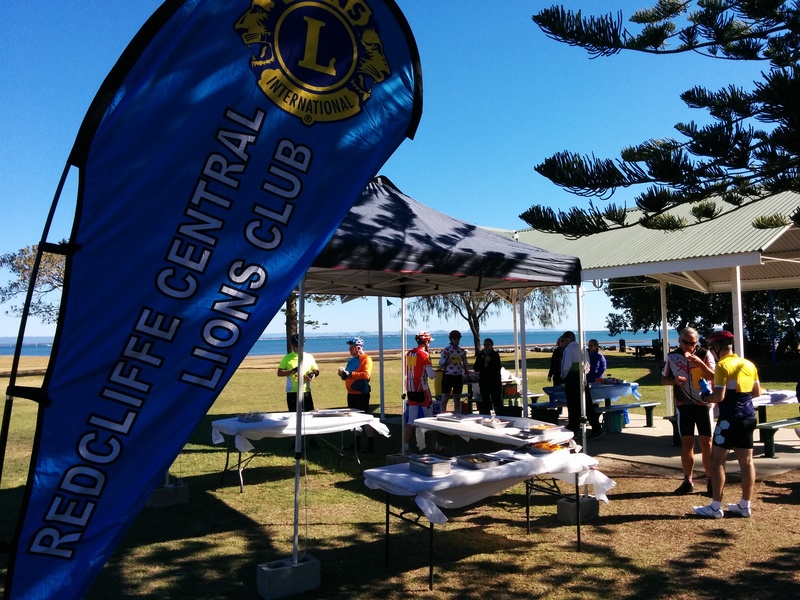 I entered the Moreton Bay 100 soon after I signed up for the Sunshine Coast Half Marathon. Because as part of my investigation into whether I could survive a half Ironman race, I wanted to see what 100km on the bike would feel like. How badly would my bum hurt? Would my legs cry mutiny by the end of such a distance? How much water would I need? How much food? A half Ironman requires that you do a 1.9km swim, a 90km ride and a 21.1km run. The run and the swim are easy enough to practice. But 90km on the bike is a long way to go by yourself. If anything goes wrong on a 90km ride, you could find yourself a long way from home or help. Initially, I’d had a look at some maps and suggestions on sites like Strava but had failed to come up with a very good (read: safe) course to try on my own, so had fallen back to attempting two laps of 50km or three laps of 30km. But I was not surprised to find that I always had an excuse for not doing the last lap on those courses. I would get back to my start point after the first or second lap, all hot and sweaty, see my car parked waiting for me where I had left it and tell myself something like ‘I actually can’t go and do that lap again, because I really have to check whether I left the oven on’. Even though I hadn’t used the oven for three weeks. 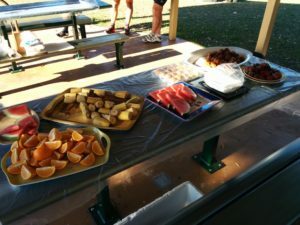 So when I found the Moreton Bay 100 and saw it was only $80 to enter, in a non-race format (so no times, no winners, no pressure) with a local course and lots of people to follow, it seemed perfect. SIDENOTE: You may be asking why I haven’t dragged my friend Wendy around a 100km course? The answer is that I am not that bad a friend. She does not wish to do 100km. 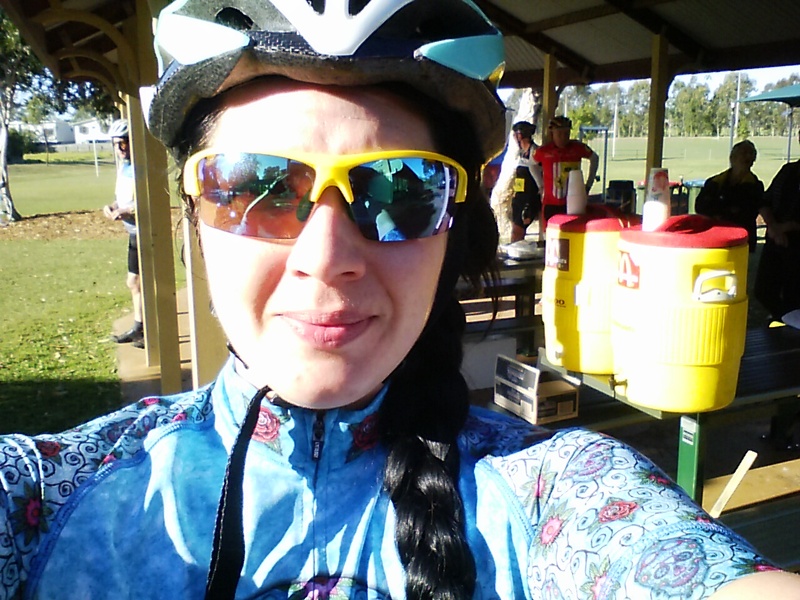 You may also ask why I have not joined a club that partakes in 100km rides regularly? The answer is that I am not reliable or good enough to join a club of any sort and I like to do my own thing. After the failure of my half marathon antics – for those of you who missed it, I did not complete the Sunny Coast Half Marathon – I must admit that I nearly pulled out of the 100km ride. 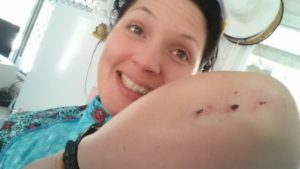 I started to believe I would never attempt a half ironman, because if I couldn’t get through a half marathon without injuring myself, I had no business tacking on a 90km bike ride and a 1.9km swim as well. 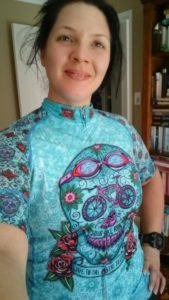 But then two things happened – my friend Lesley (the guest blogger from a few weeks ago) emailed me a story about The Iron Nun. And then Michelle, a lady I have adopted as a friend via Instagram (she didn’t have a say in the matter but I assume this is how social media works, just adopting friends and acquaintances until you have too many) posted a nice picture with an inspiring caption. The Iron Nun (an elderly nun who partakes in Ironman triathlons) said to me (via Lesley’s email) that ‘the only failure is not to try’. Which resonated and stuck with me because this entire blog is about trying stuff, and I suddenly couldn’t remember why I had given up on trying a half ironman. Michelle the Instagram Friend (by way of photo caption) said ‘though every day I am rejected and every day I feel like a failure, I will continue to fight until I find what I am looking for in this life’. I felt like a failure, I realised! But I wasn’t one, just like Michelle isn’t! It is just a feeling. How stupid of me to let a feeling, a stupid emotion, get in the way of what I would like to try. So on Saturday, I dutifully took the front wheel off my bike and packed everything into my little car. My new car doesn’t have a tow bar on it yet (for attaching the bike mount) so everything has to be dismantled and stashed inside. I then packed a bag full of sunscreen, energy gels, water and money, and threw that into the car alongside the tyre pump I decided to take with me. With that hard part done (you’d be surprised how overwhelming it can be to pack for an event you don’t think you want to go to) I felt a lot more positive about the whole thing. Photographic evidence that it was TEN DEGREES! I woke up at 3.30am, which was not the plan I’d had in my head but apparently that suited the buterflies in my stomach just fine. I checked Instagram, I ate some breakfast and then I got dressed in my new Cycology jersey, which I’d been saving for this special occasion. Unfortunately they’d sold out of the one I originally lusted after by the time I got around to awarding myself a proper lycra kit, but this ‘Tri to Live, Live to Tri’ one (pictured above, the blue top) is actually much better and I had a few people comment on it during the ride. Over the top of the new jersey, I put on a jacket. Because it was absolutely freezing. I get up at 4am fairly regularly, so I can say with some authority that it was one of the coldest mornings we have had all winter in my home suburb of Burpengary. I was glad to get into my car and turn the heater on, which is how I found out that it was ten degrees outside. Ten. TEN!! See above. It took less than half an hour to arrive at the ride precinct (not a race precinct, for once) over at the Pine Rivers Showgrounds. It has been many years since I’d last been to these showgrounds but they seemed pretty much the same as when I was last there, except darker. The usual outstanding examples of early 1900s barn-chic architecture was on display as I went and sought out a toilet. I picked up my yellow race bib from the lovely volunteers and I was lucky not to walk straight into a cobweb strung between two little trees on the way back to my car, because just above my head sat a spider as big as my massive leg muscles are round, waiting to wrap me in its silken threads and gobble me up for breakfast. 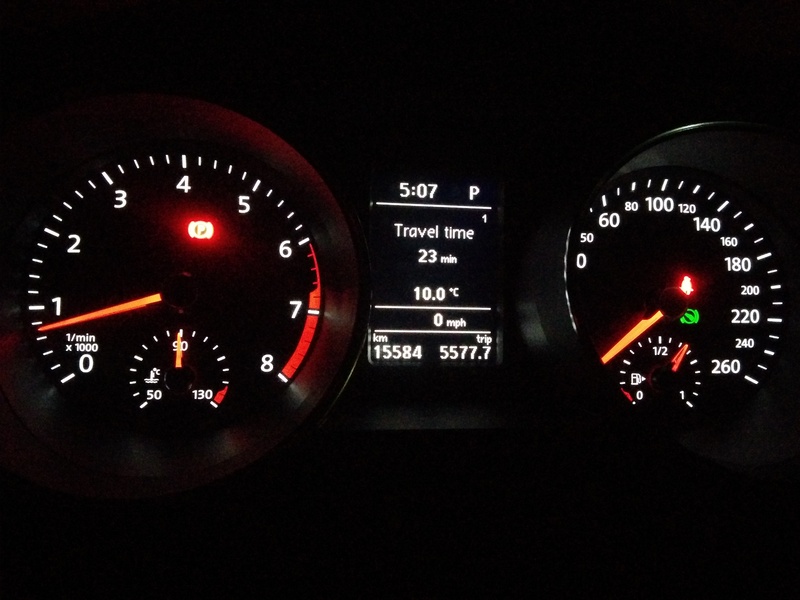 With plenty of time until kick-off at 6.15, I jumped back in the car to soak up the last of the warmth from my heater. I had some water. Then it was time to pull my bike out and put it together. To complete this bit of mechanical bravery, I needed to turn the car headlights on and work out the front of the car. 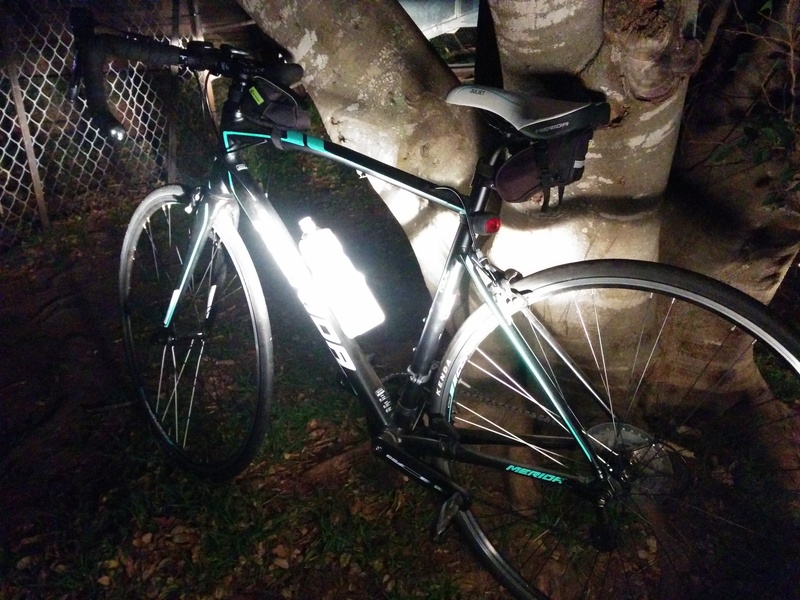 It was like working under a spotlight and I was nervous about the other bike ride participants noticing that I am clearly a fraud who knows nothing about bikes or cycling. But it only took a few minutes and I was satisfied with my handiwork when I could spin the wheels nice and smoothly. I didn’t smile or pat myself on the back or fist pump the air, even though I wanted to. I kept a straight face that I hoped said ‘I totally know what I am doing’ and then swiftly popped my helmet and special cleat shoes on, in order to take my bike for a spin around the carpark and make sure it wouldn’t fall apart. Success. The only thing left to do was to make a few more toilet stops, drink some more water and eat a banana. I don’t know where the other 43 minutes went but before I knew it, there was a call over the loudspeaker to say there were 4 minutes left to go before the start of the 100km ride. I ripped off my jacket and scooted over to the giant inflatable arch that marked the start and finish. I tried to start at the back, assuming that even though it wasn’t a race there would be plenty of people (read: men) who would still treat it as a race and want to get away quickly. Also, I assumed that most people would be much more proficient riders than I, so they would obviously be a lot faster. You can imagine my confusion, then, when it seemed everybody I had ended up with was travelling very slowly. We had a very small hill to go up first, so I wondered whether their feet (which were presumably frozen like mine were) could not apply the pressure required to make the pedal go round on such a steep gradient. I overtook some people. Back on the flats, we still seemed to be going at a very soft pace. I was all for not racing, but I also wanted to get home in time for lunch. I pushed on a bit and tried to find a group that might be doing a slightly harder speed. Eventually we passed Burpengary train station, where I had stood and waited for the train every day when I worked for another company, in a Brisbane City office (for four years) and I knew (from the ride briefing) this meant it was time for pit stop number one – at Burpengary Community Hall, where I had been just a few months ago for a Parkinson’s talk with Grandpa. I do live in Burpengary, but it is a big-ish suburb and I don’t live in the main part of town. So I couldn’t see my house or anything, but it was nice to be in familiar territory. The volunteers at the station were the best of any event I have been to, stocking me up with fruit and cake, water and electrolytes. I had packed energy gels and water on my bike, but I didn’t need the gels at all and only took on my own water in the last 25km of the ride. The pit-stops were just too good. 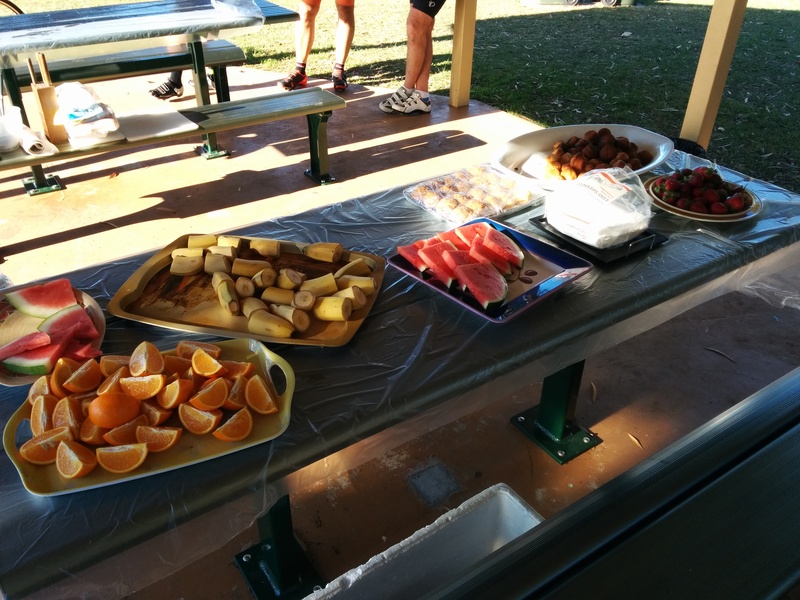 It felt a bit strange to stop part way through the event and have a relaxed five minute breather with food and a chat. 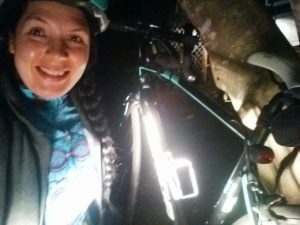 I was keen to get started on the road again as soon as possible, so I headed back to the driveway once I had taken a selfie for the blog and Instagram. In spite of my efforts, I hadn’t had any luck finding a group that could pace me up to the first break area. So before I left, I decided to wait and see if anyone else was leaving, so that I could tag along. Logically, I thought anyone that had arrived before me must be travelling faster than me, as I’d ended up doing a semi-decent pace when I stopped worrying about staying with the groups I found myself in. So if I could find a fast group to ride with for a while before they dropped me, at least I’d be less lonely. I looked around. Nobody was leaving. I waited. Nothing. I looked back to the road and was just about to set off when three other people magically appeared from behind me and set off at the same time. I had a group! 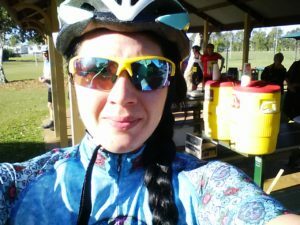 We were two ladies and two men and we actually rode the rest of the way (another 60km from Burpengary) together as a team. Thank you Triathlon Gods. At the 64km mark, the second and final pit stop appeared before us. It had the same food and drink available, but a much better view. It was set up in a park at Scarborough. After Burpengary, we’d headed straight through Deception Bay to follow the coast around through Redcliffe and Shorncliffe. Although we’d travelled the last 15km together, it was the first time for the four of us in our new little group to properly say hello and introduce ourselves. Both the men were called John and the other lady was Karen, which they agreed was close enough to Lauren anyway and we had a good laugh about that. I wasn’t sure if they were crazy or just over-appreciating a rubbish joke to seem more friendly, but either way I liked it. Crazy is OK by me, as is laughing at jokes that aren’t funny to make friends. Being the youngest in the group and the least experienced (which they somehow sensed, I think) I was taken under the wings of the other three and they were keen to make sure I was not falling behind at any point. This amused me at first because I was feeling great, and at times I was sure I could have pushed harder and gone faster if I hadn’t found such a nice group that I wanted to stay with. But then we hit the 80km mark and everything started to hurt a bit more. My lower back ached terribly. My bottom wanted me to get off the bike immediately. My shoulders were stiff and tense. My legs were OK, but would not have been upset to stop. Having John 1, John 2 and Karen there to chat to really helped when the going got tough. Watching them signal to me about bits of rubbish on the ground, or cars pulling out ahead, kept my mind on other things. If I sat at the back, drafting off them in the little wind tunnel they made, I could stop spinning my legs every now and then and stretch my back up like a cat. Warning them about cars coming up from behind gave me a job to focus on. Riding in a group of strangers was as fun as riding with Wendy, my friend. Having made this point, I should probably have another go at 100km (possibly on the same route) to see if I can manage it without these nice distractions. In a race I am likely to be by myself and the mental battle would be much harder, so now that I know I can physically do it, I should practice it. In fact, even with the help of John, John and Karen I did not enjoy the last 10km of the ride at all. It was about 10.30am by that point and the traffic was heavy around Strathpine, heading towards the showgrounds. There were lots of traffic lights, which all seemed to turn red at the exact wrong time. My heart started beating strangely and I felt sick. I wondered what would happen when I passed out. I didn’t pass out, but I probably needed to take on some water. I must practice drinking on the bike! A graze, mostly to my ego though. I should also mention that yes, I did manage to be the only person in the event (I think) that fell off their bike. I am nothing if not predictable. 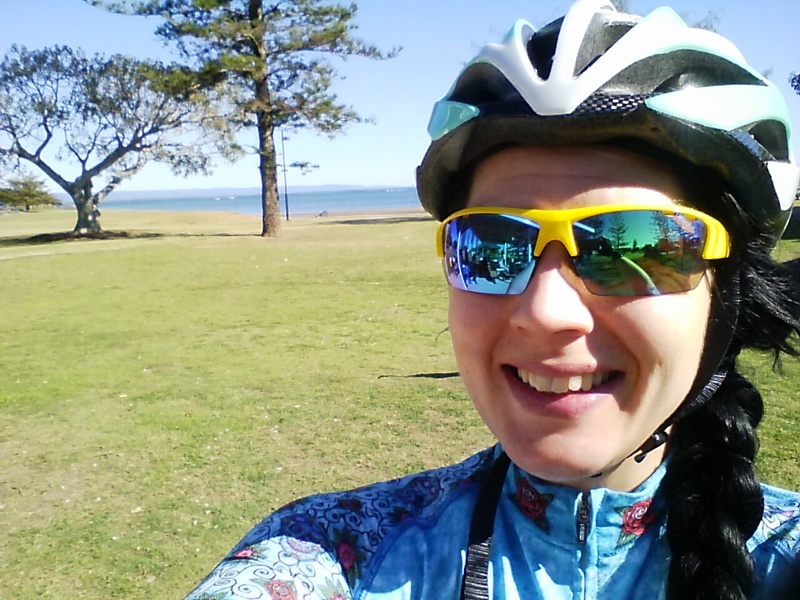 With about 17km to go, we were approaching a roundabout at Shorncliffe (to start heading away from the sea, towards Deagon) and had caught up to a few other riders doing the 100km route. We all got a bit close as we stopped for the first roundabout, then made our way over to a second roundabout. The call from the front of the pack was ‘clear, clear, stopping, stoooop!! !’ so we went from accelerating to stopping in too short a timeframe for my poor little brain to handle. It was as much as I could do to brake in time to not crash into Karen’s bike, let alone un-clip my shoes and stand up. So I just laid down instead. Everybody, including our temporary group members, stopped to help me and see if I was alright. It was very embarrassing. I was fine. When we crossed the finish line, the phtotographer took our picture and I am hoping he got one of the four of us, which I will share with you when available. As soon as I got off the bike I felt happy and proud of my achievement, and almost instantly forgot the promises I made myself about never having to get on a bike again ever in my life. For one thing I have to be able to do 40km at the upcoming Noosa Tri and I simply don’t know how I would do that without a bike. This entry was posted in Show Me Bike and tagged bike, cleats, cycling, Half ironman, lycra, newbie, quitting, road bike, training, triathlon, Triathlon Gods. Bookmark the permalink. This was lovely to read because you so obviously enjoyed it and it must have done your confidence some good. You deserve it! That combination of a huge challenge completed but also enjoyed is a rare and special thing. I second mum’s comment, re the joining of a cycling club. I fully plan to join the club once I get my own bike (soon!) even though I will be nowhere near what could be deemed as ‘good enough’. Most clubs are very happy to take new members under their wing and help them improve. Also, as a side note, I’m sure Hannah won’t mind me telling you that, as super strong as she is, she attempted a 100 miler yesterday and conked out after around 60. Nothing left in the tank, and Jay had to go pick her up! So it happens to even the best of cyclists! Poor Hannah! But 100 miles? Good lord! I assume she was alone, which is superhuman I reckon. Absolutely amazing. Thank you too for your encouragement on joining a club. I must admit that having seen all the riders yesterday – of varying abilities but obviously all avid cyclists – your comments make sense! Most of them would have been members of some kind of riding group, not just to be sociable (which would scare me because I am not sociable at all) but to have the option to join a ride when the opportunity arises. Almost like signing up for parkrun or something? I am going to look into it!